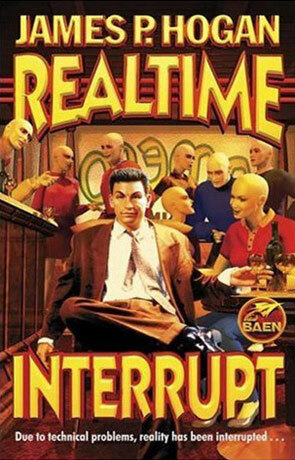 Realtime Interrupt is a science fiction novel by James P Hogan. This book has a theme somewhat similar to Permutation City by Greg Egan - Again it's about VR and how far it can be taken. Hogan does a nice job of it, but I wasn't as fascinated by Realtime Interrupt as I was with Permutation City. The main character Joe Corrigan wakes up and finds himself in a world he thinks is reality, but after a while (several years actually) he figures out that it's actually a virtual world and that he (and several others) are put there to give the VR system a model for improving the computer modeled people in the VR - the goal is to make a VR world where new products and PR campaigns can be tested at virtually (sic) no cost (sounds a lot like an old story, whose title I have forgotten). Anyway, the story is well written, but I found some of the techno babble a bit stupid, but there isn't so much techno babble that it gets to be annoying. Maybe what I missed most in this story was a good and solid character - for most of the story Corrigan is the only real character (the rest is computer models and Hogan has an excuse when he makes them rather two-dimentional), but the Corrigan character just isn't good enough to make up for this. Written on 29th January 1999 by TC.